Should Your Startup Consider HR Outsourcing? When expanding your new startup into different states you may find your success is bringing on an unexpected increase in your workload when it comes to compliance. This can cause your business some major headaches. Startup HR outsourcing might be your best choice when trying to prevent any issues that come along with operating in multiple states. Crossing state lines can introduce a lot of new hassles. You don’t want these new details to take up all of your valuable time and prevent you from focusing on continuing to grow your business. Things like taxes, payroll, workers’ comp laws, licensing, and HR procedures can all vary from state to state or even county to county. These complications can often be too much for one person to handle. When in-house employees are entrusted with this burden it can prevent them from focusing on more pressing tasks for which they are more qualified. For this reason, we recommend outsourcing these burdens to those who are professionals at dealing with these challenges. 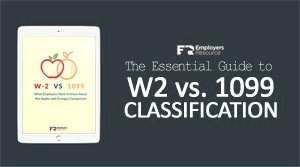 Moe, the ideal employee, represents the PEO services of Employers Resource. We have the ability to scale with your business as you see fit. Anywhere in the U.S., just point to a location, and we can make it happen. We call this advantage; “Moe-bility”. Pick a state you want to expand into and we will make sure compliance issues won’t be a problem. Learn more about other benefits a PEO offers your startup. When it comes to running payroll and dealing with taxes in different states, we have the knowledge and experience to help you succeed. In fact, we were the first PEO to be running payroll in all 50 states. You won’t have to keep up with different tax laws based on the different states or cities you may be working in. We take care of it for you. Learn more about the specific benefits that PEO payroll administration offers your startup. One of our clients have employees who operate flight simulators all across the United States, yet payroll is still easy and simple for them. All their locations simply report their payroll to our processing center, we take care of the rest. We are not your average workers’ comp solution, we are the best workers’ comp solution. We take pride in keeping our clients updated, compliant and protected no matter the circumstance or location. We prove to be invaluable when you receive a claim, but also help prevent any accidents from happening in the first place through our one-of-a-kind on-the-ground safety team. Nothing can stall your fast growing company like a costly workers’ comp claim. Learn about how we prevent workers’ comp claims and how we can turn safety into a competitive advantage for your startup. This is another aspect that can vary widely from state to state. Does your state require paid sick leave, have unique paid time off requirements, exempt vs. nonexempt status requirements, independent contractor restrictions, documentation and reporting requirements, or other unique labor and employment laws? Since we have already worked with every state’s different regulations, we are prepared for anything and will be your guardian to protect you in these areas during the expansion into new locations. When you have Moe-bility from our HR outsourcing it’s like tylenol for your business growing pains. We are experienced in every state, so we know how to mitigate compliance risk and ensure you’re current with the most up-to-date information and services available. A turn-key HR and compliance solution for any state you want to do business in. Learn more about what a PEO offers here. Our complete HR packages help new companies start stronger.